Vinification & Aging: After the grapes were harvested manually in October, they went to the selected clusters, destemmed and pressed. The must went in the first alcoholic fermentation for 24-36 hours. After that the wine rested for 15-20 days of maceration. Once the wine is ready, it is transferred into French wooden casks for a 12-month ageing period. The ageing process continues after the wine is bottled for an additional 8 months until its final release. These native clones are considered the best ones from Friuli. Already known in the 1700s, this clone has spread out in the entire territory of the Friuli region. 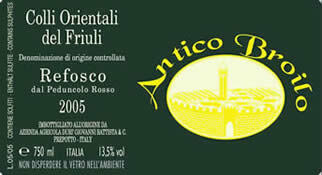 At Antico Broilo, they still have the tendrils that date to the beginning of the twentieth century. Description: Dark deep red color with intense purple notes. Intense earthy aromas with wild berries notes. Full body rich and quite complex. Food Pairing: Good pairing for wild boar, game and also venison.